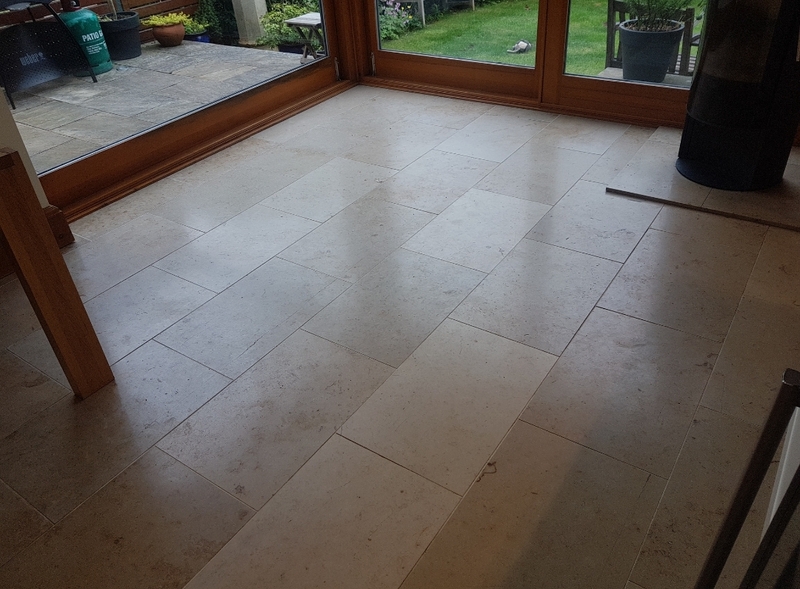 This is a travertine floor had been laid in the Kitchen and Dining room of a house on the outskirts of Edinburgh. It had been some time since it had last been polished and the stone had become dull in appearance and some of the grout had become grubby with dirt. 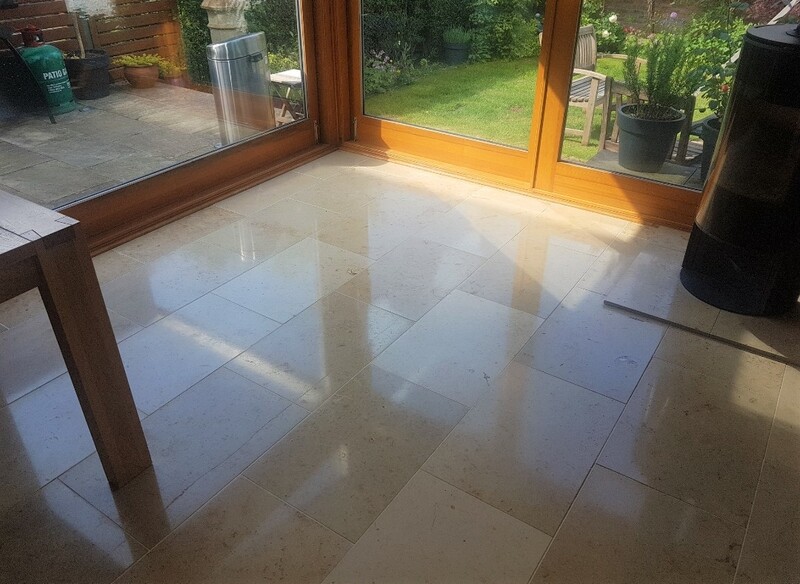 This is a common problem with Stone floors which will lose their appearance overtime with general usage and this is why we recommend an annual maintenance visit where in a few hours we re-polish the stone and top-up the sealer. Having explained what was required to restore the floor a quote was provided to cover the work and materials which would take two days. The quote was agreed, and a date set to start the work. On the first day we gave the floor a thorough clean with a strong dilution of Tile Doctor Pro-Clean to remove what was left of the old sealer and surface dirt. Pro-Clean is a versatile tile and grout cleaner that is safe to use on natural stone. We use a floor buffer fitted with a black pad running at slow speed to work the solution into the Travertine. Once done the soiled solution is rinsed away with water and then extracted with a wet vacuum. Having the right tools for this work really helps achieve a thorough and quicker result. Once I was satisfied with cleaning, I set about using a set of Diamond encrusted burnishing pads fitted to a rotary machine. Applied with water which lubricates the process this system closes the pores in the stone and restores the polished appearance. The system comprises four main pads of varying grit and I began by applying the coarse 400-grit pad, before moving on to medium 800-grit and then finishing with the fine 1500-grit pad. The floor has to be rinsed with more water between each pad to remove the soil that is generated, again a wet vacuum come in very handy for extracting the slurry. The grout was also scrubbed by hand using more Pro-Clean and stiff brush as the pads can struggle to reach down into the recess of the grout lines. The floor was left to dry off overnight and then the next day work continued with the application of the fourth burnishing pad in the set which is a very fine 3000-grit pad. This pad is applied dry to the floor with a spray of water using a technique we call a ‘Spray Burnish’. 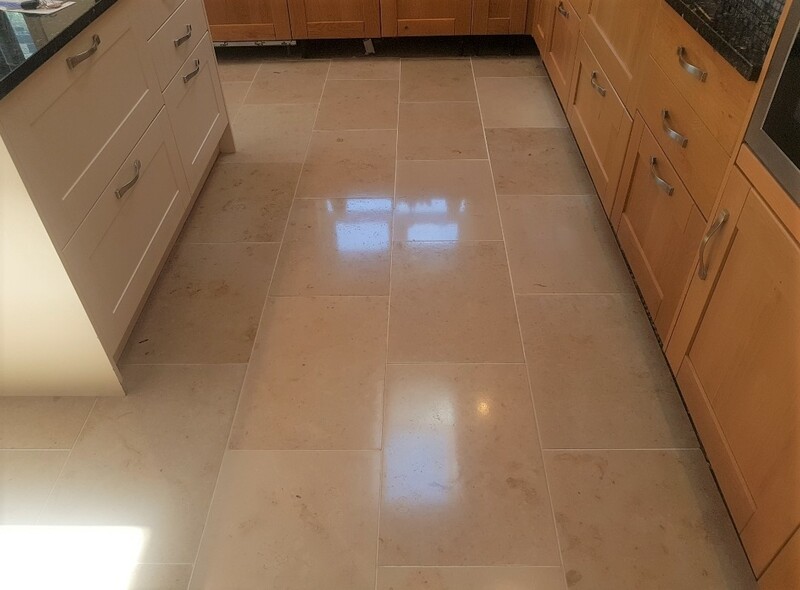 This final pad brings up the polished appearance of the stone even further and has the added advantage of leaving the floor dry. To seal the Travertine my choice of sealer was Tile Doctor Colour Grow, which was applied in two separate coats. The sealer will protect the floor against wear and tear, while also enhancing the natural shades in the Travertine thanks to the sealer’s colour intensifying formula. Once the second coat was dry, I ran over the floor with a white buffing pad to remove any excess sealer and to further buff up the appearance of the stone. 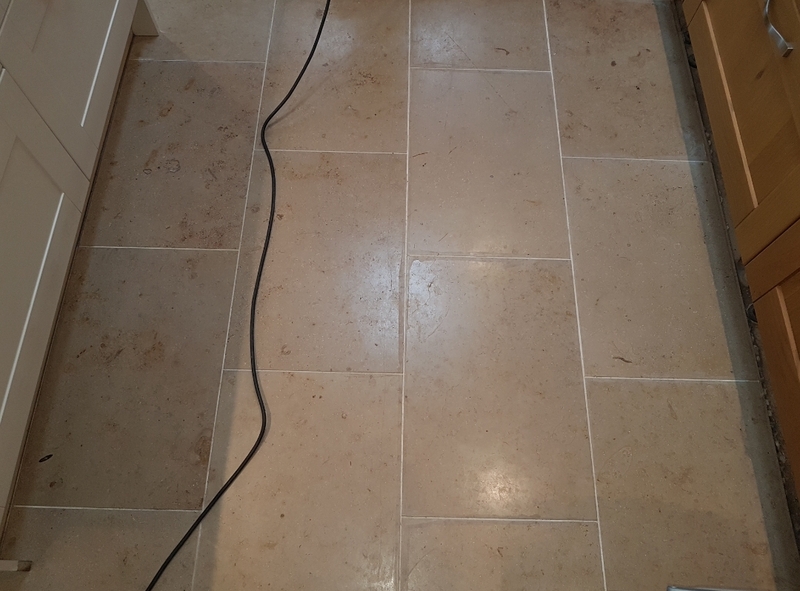 The floor responded well to the treatment and the colours in the Travertine have really come alive. Before leaving I left the owner with a bottle of Tile Doctor Stone Soap which they can use for the regular cleaning of the floor. This product is especially recommended for the maintenance cleaning of polished stone as its sealer safe and will help maintain the patina.